There are some nights were we want a light, easy and fun meal. We like to do Appis for Dinner where we’ll do up a few appetizers and everyone can have a bit of everything. One of our favourites is the Hummus, Chicken and Avocado Flat Bread. It has only a few ingredients making it easy to make and it’s healthy! Plus the girls like it which is a huge plus! 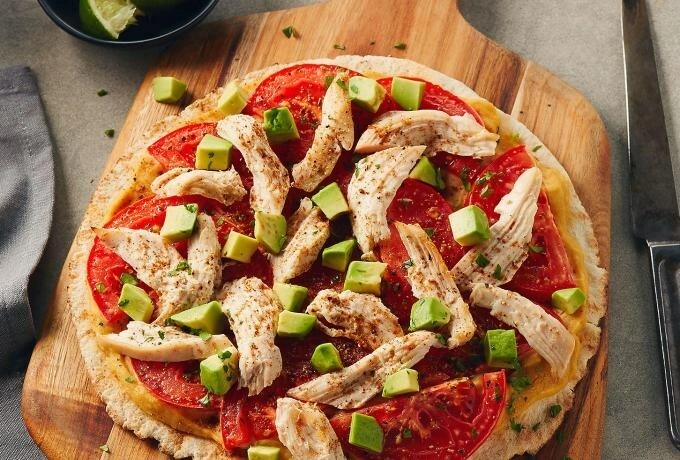 Chicken meets hummus and avocado in this quick, filling and amazingly delicious baked flat bread. Lean chicken and the chickpeas in the hummus give a good amount of protein to help you stay full longer. The creaminess of the hummus and avocado make it easy not to miss the more traditional cheese often on baked flat bread. Preheat oven to 350°F (190°C). Place flat bread on baking tray. Spread evenly with hummus. Slice tomato vertically, lay flat and cut into half moon shapes. Layer sliced tomatoes over the hummus. Shred chicken and place over tomatoes. Sprinkle with garam masala and freshly ground black pepper. Bake for 10-15 minutes until heated through. Remove from oven and top with the fresh diced avocado and a sprinkle of fresh lime juice. Garnish with minced cilantro (optional garnish). I was able to gather all the correct ingredients on my way home from work using the new Chicken.ca App!! To learn more about the amazing Shopping App from the Chicken Farmer of Canada, join us for a twitter party on November 25th at 8pm EST!! CityLine & Chicken Farmers team up for a great contest! Sundays are Football Sundays in our house! It’s great to come home from church, put dinner in the slow cooker, then sit back and watch some football! Oh, I probably should have said…sit back, open a beer and watch some football! The Chicken Famers teamed up with Rickard’s this month! I was sent a tasters pack of Rickard’s beers: White, Red, Blond and Dark. Rickard’s website taught me how to pair beers with some of my favourite foods! 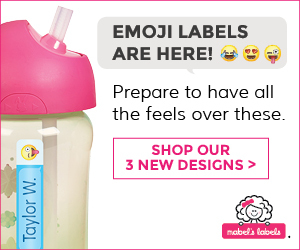 They also have some amazing recipes! I got a little creative with their Beer Can Chicken recipe and decided to do something similar in my slow cooker. I mixed up the ingredients for the rub, rubbed it all over the bird and placed it in the slow cooker. Very carefully, I poured the beer in the slow cooker making sure I didn’t get any on the bird. I put the meat thermometer in, put the lid on and set it on high. See you in a few hours birdy! Once the internal temperature of the chicken reached 165 degrees, she was done! It took about 3 hours on high. I don’t like cooking by time alone because the internal temperature for the meat is a much safer way to know that it is correct. I had to cut it very carefully as it was falling off the bone! We had it with just asparagus, but this Asparagus & Chicken Salad with Sesame Ginger Dressing would be very yummy with it as well! Go to chicken.ca to see the full recipe! Join the #CluckToberFext Twitter party to learn more about Rickard’s and Chicken Famers! To RSVP and to see the amazing prizes, click here or the image above! Now that activities are in full swing, there are many nights where we need to get something on the table quickly! We’re eating quickly before heading out the door, between activities or even on the run! Fast food used to be our crutch, but when we made the choice to live a healthier lifestyle, that isn’t an option any more. So now our “fast food” is just recipes that don’t take a lot of prep or cook time! 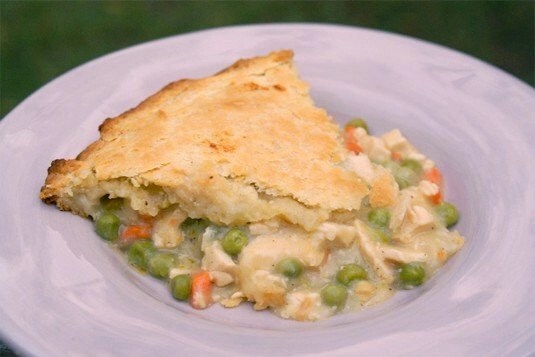 This is a family favourite and is really easy with left-over chicken, frozen veggies, canned soup and a pre-made pie crusts! Prepped, cooked and ready to eat in 50 minutes! Chicken.ca has so many great Quick and Easy Recipes to choose from! What kid doesn’t love Chicken Fingers? Breakfast for Dinner is always a favourite! On the weekends, if we cook a big roast chicken, there is always leftovers. Using the leftover chicken breast, the Chicken & Egg in Mug is not only quick and easy, my girls are able to make it themselves! Using convenience products like canned soup, cooked chicken, frozen veggies and refrigerated pie crusts make this comfort food classic a cinch to prepare. It’s chock full of flavor and ready in just 50 minutes. Heat the oven to 400°F. Line the bottom of a 9-inch pie plate with 1 pie crust. Trim any excess. Stir the soup, milk, chicken and vegetables in a medium bowl. Spoon the chicken mixture into the pie plate. Sprinkle with 3/4 cup cheese. Place the remaining pie crust over the filling. Trim any excess. Crimp the edges of the top and bottom crusts together. Using a sharp knife, cut several slits in the top crust. Bake for 35 minutes or until the crust is golden brown. Sprinkle the crust with the remaining cheese. Recently I posted about the great contest that the Chicken Farmers are running where you can win a trip to Ottawa! Entrants must submit a unique recipe using the required 4 ingredients provided, photo optional. I made my own recipe to give you an idea of how easy it can be! You can see more info and other recipes if you follow the #ChickenChallenge hashtag on Twitter or Facebook. Combine the Ginger Ale, olive oil, soy sauce, lime juice, garlic powder, honey, and salt. Stir together. Marinade the 12 boneless skinless chicken thighs (covered) in the fridge for at least 1 hour and preferably overnight or 8-10 hours. Meanwhile bring the water and bouillon to boil in a large pot. Cook quinoa as per the instructions on the package. Remove from the heat and fluff the quinoa. Let stand for about 5-10 minutes. Prepare all of the ingredients by draining, rinsing, and chopping them as explained in the ingredient list. Placing a serving of quinoa on each plate. Top with a chicken thigh. Divide the salsa evenly among the four plates. Please note: With my new lifestyle changes, I’m no longer consuming soda pop. I substituted the Ginger Ale for a modified version of this Homemade Gingerale recipe without the sugar. Don’t forget to like and follow the Chicken Farmers of Canada profiles: Facebook: Canadian Chicken and @ChickenFarmers on Twitter. Head over to the Canadian Chicken Facebook Fan page to enter! Third Prize – Chicken Farmers of Canada prize pack, Maple Leaf Foods prize pack and $100 food bank donation (approximate value $225). Contest begins on April 24th, 2014 at 12:01 a.m. EST and ends on May 29th, 2014 at 11:59 p.m. EST. Open to Canadian residents who are the age of majority in the province or territory of residence at time of entry. Now there is really great news about chicken! Recently, studies have shown that chicken is a SuperFood. If prepared with the skin on, it is even healthier for you! [You] can cook your chicken with the skin on, retaining all the moisture and flavour you love, and then remove it prior to serving to achieve essentially the same health benefit as a skinless cut. That’s right, a breast of chicken cooked with skin-on and then removed actually has less fat and calories than a skinless breast. How is this possible? When the chicken is cooking, the fat in the breast flows out of the meat and becomes trapped in the skin. The skin of the chicken becomes saturated with fat and retains it once it is removed. Beer Can chicken ~ skin on! With our new knowledge in hand, I gladly made a beer can chicken for the family! Get the amazing recipe from Chicken.ca. Enter to win a great Stainless Steel BBQ set! I don’t know about you, but I’m so ready for the snow to go away and for the warm weather to appear! Maybe Mother Nature needs to win a BBQ set to get her in a warmer mood!